Erosion control: Bermudagrass is used for critical area planting (including channels and pond banks), grassed waterways and vegetated flumes. Livestock: Bermudagrass provides excellent pasture and hay with proper management. Forage quality is dependent on soil fertility and stage of growth. Bermudagrass is probably Asian in origin and was documented as an important grass in the United States by 1807. It is a long-lived, warm season perennial that spreads by rhizones, stolons and seed. Stems are leafy, branched and 4 to 6 inches tall. Under favorable conditions, stems may be 12 to 18 inches high. Stems are short jointed. Leaves are flat and spreading. The ligule is a circle of white hairs. Leaves may be hairy or smooth. Seed heads are usually in one whorl of 3 to 7 spikes, each about 1 to 2 1/2 inches long. Some robust forms may have up to 10 spikes in 2 whorls. There are approximately 2,071,000 hulled seeds per pound. Although a few hardy strains of Bermudagrass persist in areas with sub-zero winter temperatures, it has achieved importance only in areas of relatively mild winters. Once established on moderately deep to deep soils, Bermudagrass maintains dense sod with 16 inches of rainfall. It can withstand sedimentation and long periods of inundation. 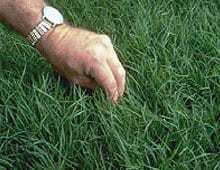 It prefers full sun and can grow rapidly at air temperatures exceeding 100º F.
Bermudagrass prefers deep soils but produces well on moderately shallow sites under irrigation and good management. It persists on poor soils but requires high nitrogen levels for best appearance. It withstands pH ranges from about 5.0 to 8.5 and is boron tolerant. It tolerates saline soils with up to 18 millimhos of electrical conductivity in the soil solution. Stands may be established by use of seed, sprigs or plugs planted during mid-spring to mid-summer followed by frequent applications of fertilizer and water. Early planting is most important in areas of marginal adaptability. Beds for seeding or planting should be firm, smooth and free of weed seed. Seed, sprigs or plugs should be placed into moist soil. For pasture or hay, drill 5 to 10 pounds of hulled seed per acre at 1/4 inch deep or less. Higher seeding rates are advisable if seed is broadcast. Both pasture and hay require good rainfall and heavy fertilizer application for high yield and quality. Thirty to 40 pounds of nitrogen should be applied in split increments for each ton of anticipated dry forage yield. Highest yields are obtained on good soils in areas of high average annual temperature with ample water. Harvest or graze at 3 to 4 weeks intervals for best yields of total digestible nutrients and protein.